The SStS Cambodia course begins in the capital city of Phnom Penh. Upon arrival, the group will spend a few days learning about the rich history of the Cambodian people, including the tragic legacy of the Khmer Rouge. The service work will then begin with visits to non-profit organizations dedicated to improving the lives of impoverished women and vulnerable children. After these experiences, students will get their first exposure to rural Cambodian life as they travel by minibus to the town of Kratie in order to connect with our primary non-profit partner, the Cambodian Rural Development Team (CRDT). After spending a day exploring Kratie and learning more about the work and mission of CRDT, the group will travel to the island village of Koh Chraeng, where they will live with villagers in traditional homes for over a week. While in Koh Chraeng, the group will experience firsthand how CRDT supports local projects aimed at improving the living standards of poor rural communities with a particular focus on sustainable environmental practices. SStS students will spend a majority of their time in Koh Chraeng doing construction and repairs at the village school as well as working with the local children. Additionally, they will be immersed in the daily routines of this rural village. Evenings will be spent listening to stories told by village elders and participating in cultural presentations and ceremonies. In order to get a feel for the adjacent countryside, the group will tour the storied Mekong River by boat and, ideally, catch a glimpse of endangered freshwater dolphins. Upon completion of the project, the group will tour several cultural sites on their way back to Kratie. From there, they will travel to Siem Reap in order to spend a few days reflecting on what they have learned about ethical leadership and touring Angkor Wat, an UNESCO World Heritage Site, which is the largest Hindu temple in the world. The mission of the Cambodian Rural Development Team is to sustainably improve food security and living standards in rural communities throughout Cambodia. To learn more, please visit their website. 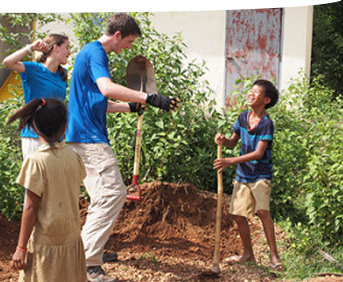 While in the village of Koh Chraeng, the students will spend much of their time doing construction work. They will also visit other non-profits in Phnom Penh and Siem Reap in order learn more about development work in Cambodia. Because the project occurs in a small village, the students will primarily walk to any sites in Koh Chraeng. While touring Angkor Wat, they will also spend a couple days exploring numerous temples on foot. 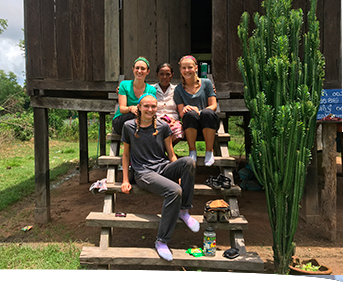 While at the rural project site, the students will live, in pairs, with Cambodian families in traditional homes. While in Phnom Penh, Kratie, and Siem Reap, they will stay in simple hotels. After a few days in Phnom Penh, the group will drive several hours to Kratie. The next day, they will travel by mini-bus and boat to Koh Chraeng. After completing the project, a day is spent driving to Siem Reap to explore Angkor Wat. There is another bus trip back to Phnom Penh at the end of the course. Students have the unique opportunity to spend over a week living, in pairs, as the guests of Cambodian families in the island village of Koh Chraeng. For a majority of the days, the group will be in the remote rural village of Koh Chraeng. However, time is also spent in Cambodia’s capital city, Phnom Penh, as well as the smaller cities of Kratie and Siem Reap. Being a global citizen is more than understanding global issues. Being a true global citizen is having the passion, as well as the courage, to make a difference in our world. During the travel phase of each SStS course, students spend time reflecting about the learning that occurs through their immersion and service experiences. These posts capture the impact of our programs on individual students. 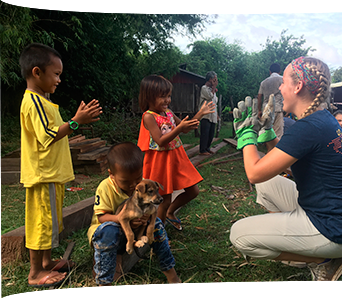 Explore the posts below to learn about the SStS Cambodia program from the important viewpoint of our students.